حضر العشاء الملحق الدبلوماسي في السفارة صاحب السمو الملكي الامير عبد العزيز بن تركي بن بدر بن سعود بن عبد العزيز ال سعود ، والملحق الثقافي الدكتور عبد العزيز بن عبدالله بن طالب واعضاء السفارة والملحقية الثقافية وعدد من رجال الاعمال السعوديين واعضاء الشرف في نادي الهلال وتبودلت خلاله الكلمات والأحاديث الودية والرياضية وقدمت الهدايا التذكارية وتمنى سعادة السفير ال صالح وجميع الحضور لممثل الوطن فريق الهلال تحقيق الفوز وأن يعود إلى الديار بنصر مؤزر يتطلع اليه الجميع. 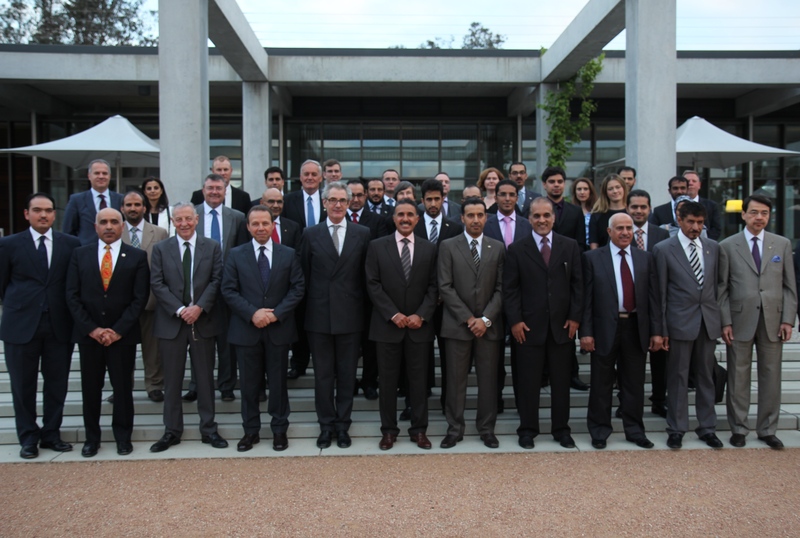 The Saudi Ambassador in Australia and New Zealand Nabil Al Saleh, has welcomed the launch of the first joint meeting of the Business Council of Saudi Australia held in Canberra. The meetings will be headed by Abdul Latif bin Misfer al-Zahrani on the Saudi side and Tom Harley on the Australian side. The joint-meetings included a program over several days between 21 and 24 Oct throughout several Australian cities, including Melbourne, Sydney and Canberra, the Australian capital. The first meeting was held in the reception hall of the Museum of History in Canberra, in the presence of a number of Australian officials and Arab Ambassadors, dignitaries, businessmen, members of the Saudi embassy’s cultural attaché and members of the Saudi Arabian Business Council of Australia. 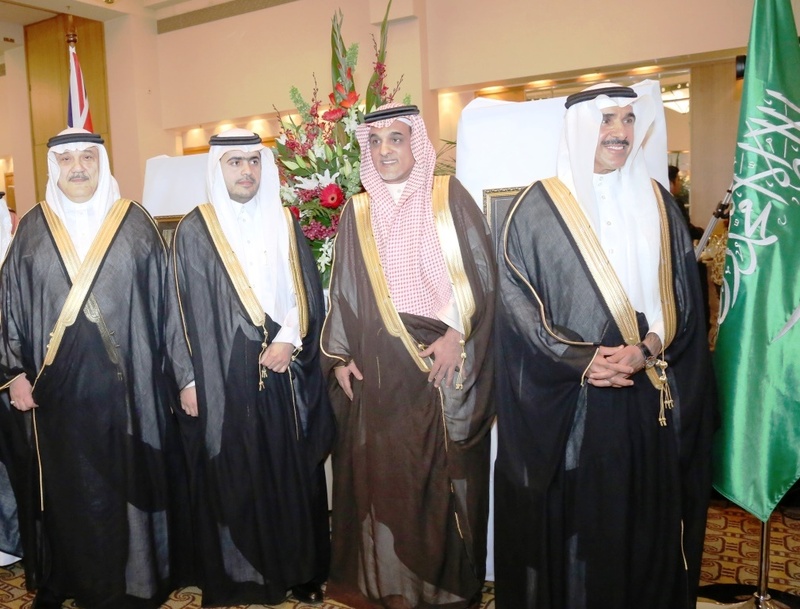 In his speech, Ambassador Al Saleh highlighted the commendable aspects of the Saudi economy and applauded the Kingdom’s leading position in the region as one of the strongest economies in the world, particularly in light of the Kingdom’s recent development and economic boom. The Ambassador also highlighted the various economic opportunities and joint investments the Kingdom holds with the UK and Australia, stressing the importance of investment and economic relations between the two countries in all fields to further development. 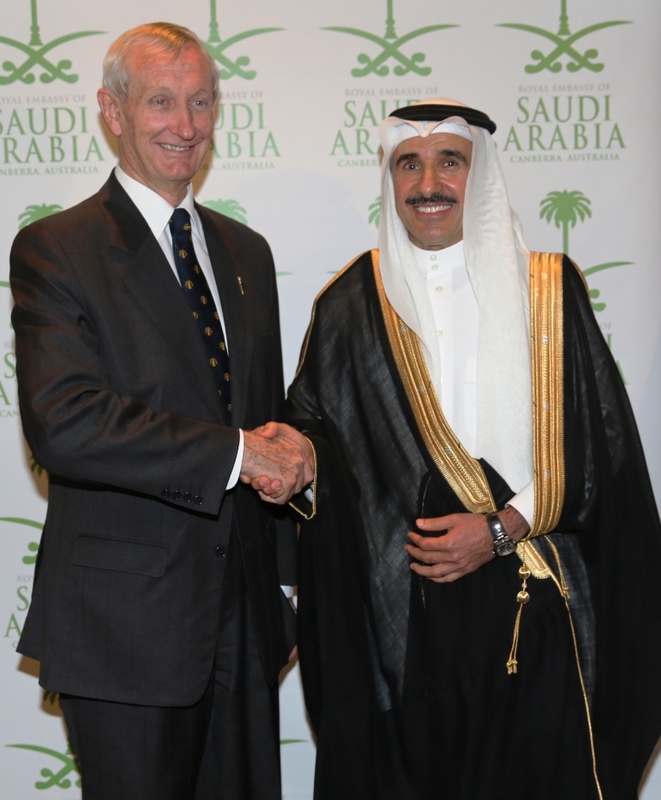 On his part, the President of the Saudi Arabian Business Council of Australia Tom Harley praised the outstanding economic role the Kingdom has in the world, stressing the importance of the Saudi Australian Business Council, as an addition to the existing efforts to strengthen the economic and cultural ties between Saudi Arabia and Australia. 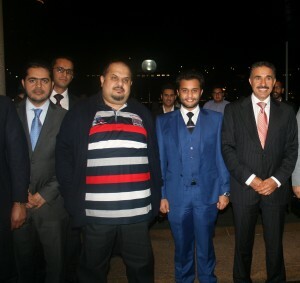 Mr Harley also praised Ambassador Al Saleh along with the members of the embassy in Canberra for their efforts in facilitating the activation of the Council, and their furtherance of economic and trade relations between the two countries. Saudi Ambassador to Australia Nabil bin Mohammed Al Saleh met at his office in the Embassy in Canberra yesterday with the Ambassador of the United States of America to Australia John Berry and his accompanying delegation. During the meeting, they reviewed bilateral relations between the two countries, ways of enhancing them, and issues of common interest. Ambassador of the Custodian of the Two Holy Mosques in Australia Nabil Al Saleh held an official reception in the Australian capital Canberra on the occasion of the Kingdom’s 84th Saudi National Day. The Ceremony was attended by Bruce Scott Deputy Speaker of the House of Representatives, Chris Cannan Chief of Protocol in Australia, Philip Ruddock MP, a number of public and political Australian figures and Ambassadors of Arab, Islamic and foreign States, members of the Diplomatic Corps, members of the Embassy, the Cultural Attaché and Arab students in Australia, where they all have been welcomed by Mr. Nabil bin Mohammed Al Saleh, Ambassador of the Custodian of the Two Holy Mosques in Australia, the Chancellor Dr. Hassan Al-Ansari, the Vice Ambassador and Dr. Abdulaziz bin Abdullah bin Taleb, the cultural attaché. The official ceremony started by exchanging greetings and best wishes to both countries by Ambassador Al-Saleh and Chief of Protocol Mr Cannan, followed by the Royal Saudi anthem and the Australian national anthem. 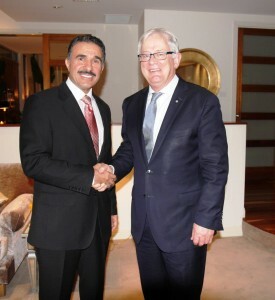 Saudi Ambassador to Australia Nabil bin Mohammed Al Saleh met in Canberra with Australian Minister of Trade and Investment Andrew Robb. During the meeting, they reviewed bilateral relations between the two countries, especially in the fields of trade and investment. 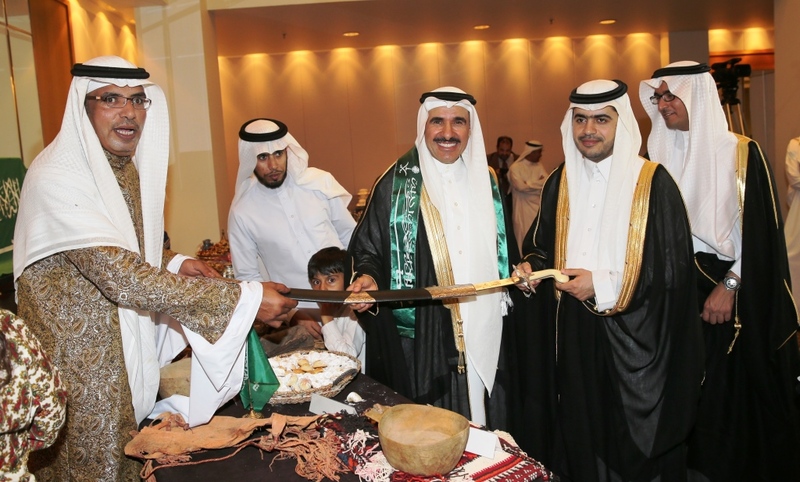 It is noteworthy that the volume of trade exchange between the two countries during the year 2013 amounted to 2.459 billion Australian dollars, including 2.190 billion dollars worth of Australian exports to the Kingdom and 269 million dollars worth of Saudi exports to Australia.